With the majority of rugged style iPhone cases on the market right now, they normally turn the sleek looking smartphone into a monstrosity of sorts – while still flaunting premium prices that make you cringe. 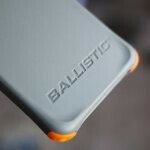 Luckily, the Ballistic Smooth Series Case for the iPhone 5 intends to change things up for the better, as it sports a very form fitting design combined with a more modest price point. In addition to that, there’s a sprinkling of personalization available with them as well. At its core, the Ballistic Smooth Series Case for the iPhone doesn’t add the normal bulk associated with rugged cases. Rather, its rubbery-like casing covers the handset from head-to-toe – with an almost sealed quality to it. As its name implies, it’s quite smooth and sports a very clean finish that manages to repel dirt and debris. On the corners of the case, there are interchangeable bumpers that help to absorb the impact in the event it’s dropped. In our quick testing, it’s able to safely protect the iPhone 5 from a drop of 5 feet onto the hard pavement. Still, we’re a bit worrisome if it were dropped from higher height. We can’t say that the Ballistic Smooth Series Case is the most stylish thing we’ve seen out there for the iPhone 5, but unlike some of the beefier rugged style cases, it’s nice to know that we can still tuck the handset into our pockets – and without any major bulk protruding out. Last thing worth noting, the $29.99 price attached to the case is something that’s reasonable, and not wallet-busting like some of the other alternatives out there. The iPhones far too beautiful to go in a case like that. But the iphone HAS to be in a case due to it being constructed so poorly. Finish rubs off, scratches easily, glass shatters, and the frame bends. Premium build quality indeed LOL. None of that has anything to do with poor construction. Anodized aluminum scratches, same thing happened months ago with an HTC phone that had black anodized aluminum. Glass isn't indestructible, it's the same gorilla glass in the iPhone as every other smartphone, and it's all luck whether or not it shatters. Stealthd I'm so done with that billy guy. It's not even worth the headache, he's new to this site yet immediately falls n with the we hate apple crowd which shows the follower that he is. He'll b ignored by me from here on out. I would think you'd be ignoring almost all of the comments, that seems to be the crowd that gathers here the most. It shouldn't b that way, but its littered with apple hating droiders. No, hard anodized aluminum can take a fair amount of abuse before it'll show the metal beneath and it wouldn't just "wear" off, you'd have to take sandpaper to it, apple probably didn't like the colors available LOL, Where Apple completely screwed the pooch is the frame bending issue go to macrumors and check it out, some iphone 5's are bending WTF!?! Well made? NO, they are not, well polished, well finished, yes, but not well constructed. They would have been better off going with a magnesium back, it can take a hit better. *digs through iphone news* Wait, PA reported about the iphone bending NOW!?! I submitted that iphone bending crap to them MONTHS ago What has PA been doing all this time!!! This. All the anodized aluminum parts in my Mustang look as good as they did the day I installed them 1-3 years ago. That includes control knobs, shifter, engine parts etc. If a no name Chinese company can figure out how to do it right, surely the brilliant minds at apple can do the same? Hell, my anodized valve stem caps are still flawless, and they're exposed to rain, snow, salt, heat and cold. I would go for an Otterbox Commuter case instead. Aren't those pretty thick tho? Honestly, case thickness doesn't bother me too much. As long as I know my device is protected, I'll take the added dimensions. It's satisfying to drop your phone, and know it's perfectly fine just by the sound of the low *thud* when it hits. Yeah I gotta agree with u on that one bro. I hate putting my iPhone in a case cuz I love the look of it, but I know me and a case is definitely best with my clumsy hands lol. Some cases can look really good, actually. Have you seen the Otterbox for the DNA? Looks pretty good. Now if only more cases were like that lol. The Ballistic SG case on my GS2 looks pretty nice though, I like the look of it. I intend to get the same case for the Nexus 4 as soon as it's released. Yeah I've seen it, a guy at my job has one...nice looking case too. And the shoddy build quality of the i5. You uh, you left that part out LOL. Not the Commuter series. You are thinking about the Defender cases. I don't like the Otterbox Commuter for the iPhone 5. It actually causes drops because the case is so slick it falls out of my wife's hands often. At least it protected it from the drops. "At least it protected it from the drops." That is what it is supposed to do. Think about how the phone would look absent the case (w/o the case, it is more slippery). The Otterbox case made both the GS III and Note II much easier to hold (less slippery) for me. Personally, I wait to buy a phone until an Otterbox Commuter case is released for the phone. It's a Justin Bieber of smartphone! It won't look though regardless what it's wearing. I have one of these cases for my Samsung Galaxy.. Love it. If it was a real ballistic case, the internals of the device would be wraped in gel for shock. The shock would be from drops and high explossives. Then the outer case would be of some dyneema fiber. Honestly it doesn't look THAT BAD. Please tell me that yellow button isn't included though.